Recently I felt the urge to wear something I haven't worn in a long time... And while digging through my stash, this one caught my eye. Givenchy Dandy Moiré. It was originally released in 2008 and I haven't worn it since then. 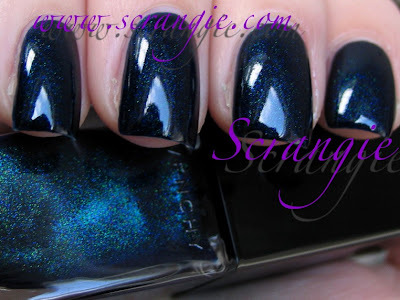 Givenchy Vernis Please! 159 Dandy Moiré. 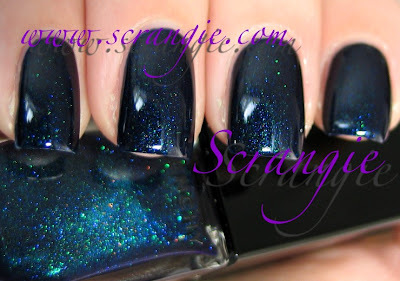 This shade is a dark midnight blue with green, glue, yellow, red and silver iridescent shimmer. Click on the flash pictures and look in the bottle. The shimmer particles look holographic, but when you look closely, they don't seem to shift colors, they are actually all different colors. The bottle also shows a bit of green duochrome around the edges, but it doesn't show up on the nail. This polish looks incredible in the bottle, but on the nail it's really bland. It looks great with flash and in really bright sunlight, but in normal daylight and indoors, it just looks black despite all that gorgeous colorful shimmer. The shimmer in the bottle is unbelievable, I just wish it sparkled as much on the nail. That might be why I haven't worn it since 2008. That, or because the bottle is FREAKIN' TINY, (.18fl oz!) so I was subconsciously trying to conserve. The formula isn't that great, either. It's incredibly thick and it doesn't flow nicely on the nail. The brush is hard to maneuver and the drying time is rather long. It's not because it's a few years old, it's been like this since the day I bought it. Another weird formula quirk is that it doesn't seem very shiny with topcoat. With a polish that costs $80 an ounce, you'd think the formula would be nicer! The polish looks unbelievably gorgeous in the bottle, and the bottle itself is pretty cool as well... It just doesn't look blue and rainbow-sparkly on the nail. Maybe it's better that way, because if it did look the same on the nail as it did in the bottle, I'd be tempted to wear it all the time and I only have .18 oz of it! It was fun to wear this for a couple days, but now it's going back in its box (the Vernis Please! box has polka dots on the inside!) until I feel like wearing it again three years from now. It is really pretty in the bottle and on your nails. Thanks for such a detailed review. Gorgeous! Is the shine natural or is that Seche Vite? Oh WOW!!! I am so in love with this color! I can't even take how much I need to own it!! AHHH It's FANTASTIC!! I wish it would have the same sparkle on the nail too... It's still gorgeous but the price is just too much. Reminds me of Chanel's Ciel de Nuit from the mid-90s, which is what started my polish love. I SO wish Chanel would bring that back! Nicole, I just wish it looked more like space on the nails! Vixxan, thank you and you're welcome! Jamie, haha, you might be able to find one on eBay or something! Beauty Shades, I think if you layered Pure Ice Heartbreaker over a dark blue shimmer, it would look even better than this! Themississippimama, ooh, similar feeling, that deep blue with silver glitter! I wish they'd bring it back too! Very annoying having all that beauty in the bottle and not on the nail! It is a gorgeous polish. Even that photos never show the real beauty of the nails or little details. I´m sure it looks even better! It looks fabulous in the photos, it's a pity it doesn't turn out as well on the nail:( But at least the pictures are good!lol! Oh, those seductive bottles. I'm wondering if this one would respond well to the "wipe it very gently with remover" trick I read about somewhere that sometimes brings out shy glitter. It looks beautiful in your pics! Too bad it has so many issues. I hate when that happens. I love the color. Your nails always look great. I love this on you and wish I had it. Have you ever used the UV lite for final coat? I'm contemplating purchasing one for myself. Any recommendations? The first backup I ever purchased was this polish, except I too haven't worn it in years!